I know, I know, this is really about mushrooms, not actual monkey heads. But I got you to look, right? 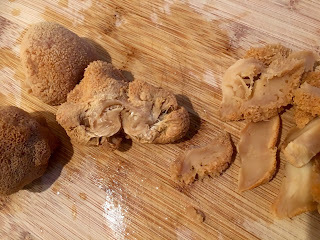 This is actually a recipe that puts the spotlight on the Chinese mushroom known as the “monkey head,” and you have to admit, that’s a pretty good name – they’re cute and fuzzy and it sounds so silly, so what’s not to like? Known in the West by a number of names, including the much more boring “pom pom mushroom,” this actually belongs to the “tooth fungus” group, showing that we are not totally bankrupt in the imagination department. The members on our shores tend to grow in long, toothy strands, though, hence the name. 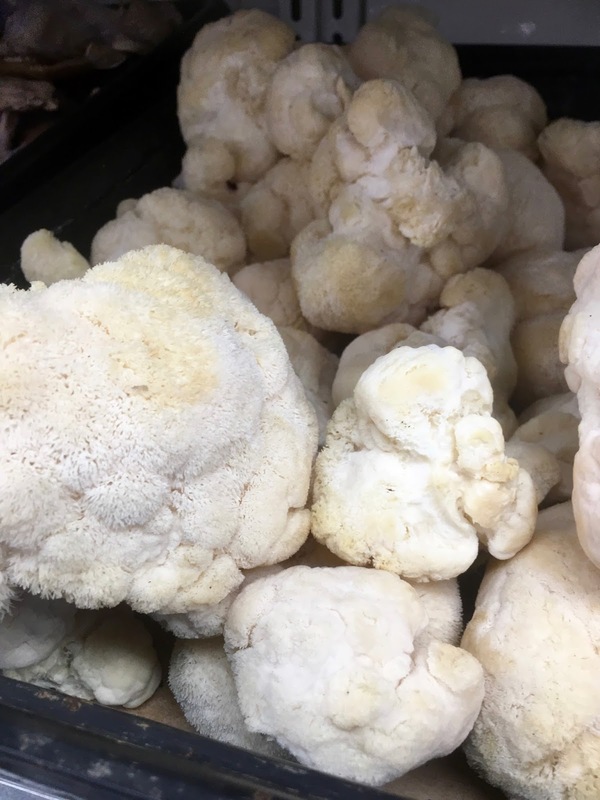 But in China, the monkey head mushroom, or Hericium erinaceus, is very, very common, especially (and almost exclusively) in its dried state. And like so many of China’s fungi, this one is beloved not only for its lovely flavor and texture, but also for its medicinal properties. It’s been shown to be a good antioxidant, among other things, so give it a whirl. You can find these golfball-size ‘shrooms in most Chinese grocery stores, dried goods markets, and herbal shops. They often come in packages. Since you won’t be able to fondle them except through the plastic, go to a place with a fast turnover, if possible. The mushrooms should be a pale brown and beige, look plump, and not be busted into pieces. Shake the bag around a bit to search for bugs, while you’re at it. Then, once you open up the bag, store the mushrooms in a jar in the pantry, where they will keep for a couple of months, much like any other dried mushroom. 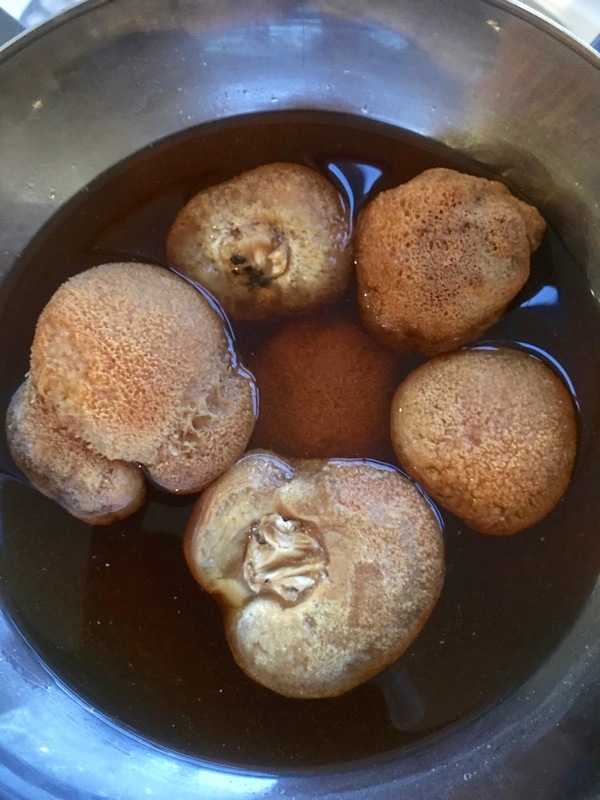 These are easy to reconstitute: rinse the mushrooms thoroughly, place them in a work bowl, cover with warm water, and give them a couple of hours or even overnight to plump up. Squeeze out the water (being sure to save it, as well as the soaking liquid) like they were little sponges, as this makes them easier to handle. Trim off the stems and then slice the balls thickly. 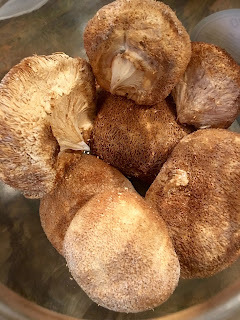 Monkey head mushrooms can be added to all sorts of braises and soups – or even a very friendly chicken potpie - but know that your meatless friends will be especially delighted with them, as these mushrooms have an almost meaty taste and texture. And so, I’ve provided my go-to chicken stock recipe below, but have also offered vegan alternatives. My secret ingredient here is oyster sauce. Or, should I say, it was the husband’s suggestion. 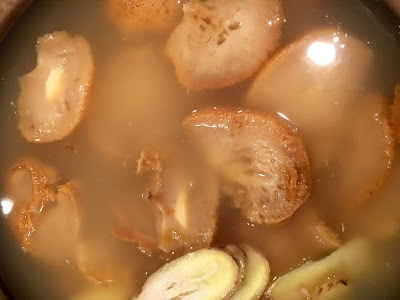 This adds great depth to the soup, and since the monkey head mushrooms possess a slight bitterness, the richness and sweetness of the oyster sauce balances this just right. The salt, sugar, and oyster sauce are all approximations, as the final flavor will require you to taste and adjust. Chicken stock – fresh or packaged – has different levels of salt and seasoning, and even strength of the chicken flavor, so taste as you go. You can sneak in some chicken fat, too, for extra mouthfeel and body, if you’re going the chicken route. And again, do feel free to monkey around with this. (Sorry.) It’s a home-style recipe that is meant to be adapted and adjusted. You can use less mushrooms and more stock, sub in different kinds of dried mushrooms, add more vegetables – whatever you like. 2. Cut off the stems and slice the mushrooms into thick (½ inch / 1 cm) pieces. Place them in a large saucepan and add the rest of the ingredients, as well as the strained soaking liquid. Bring the pot to a boil, lower the heat to a simmer, and cook the pot uncovered for at least 5 hours. Top off the pot with boiling water to maintain around 1 quart (1 L) of stock. 3. Taste the soup and adjust the seasoning as needed (see headnotes). Serve hot. Late but--congratulations on the nomination--so deserved!! I've seen these mushrooms and never known what to do with them-thanks! You're a doll. Thank you, Diane!! I must be lucky. Every year, when they are in season, I get them fresh. Around May. It is a fairly short season, though and I do buy the dried ones when it's over. Brings back good memories. The first time I went to China, back in '81, setting up a lab at a gov'ment institute, I hosted the compulsory banquet for colleagues and institute brass. About 10 people, cost me about $110, big money. One of the colleagues ordered, and one dish was monkey's head in a kind of brown sauce (can't recall the type). Really delicious, but never have had it since, to my disappointment. It also was my first time with sea cucumber, also delicious. Oh, the variety I had back then was rather shaggy, and a medium chestnut-brown in color, looking especially like the name describes. Was said to be something very special. If I had known they were common, I would have made an effort to get them in season. Maybe next time. Sounds like an amazing meal. Sea cucumbers have incredible texture, don't they? As for these ingredients, you'll probably find that once you recognize them, you'll see them everywhere. It's the same with language, at least for me. Once I learn a new word, everyone seems to be saying it. Just received my first order of Monkey Head Mushrooms. Being an older geandma, cgef, cook, I had to smell first. To me, like warm bread out of oven. To taste, almost like popcorn. Anazing😆 Can't wait to try them. Thankyou for sharing recipe. Haha! Hope you like them as much as I do! Just got a dried pack from Tai Pan grocery store, and now on the stove, thanks will try later when cooked, my first time cooking this mushroom.